The papers of the musicologist Ludwig Misch in the LBI archives tell a remarkable story about both the legacy of German-Jewish musicians and composers and the hardships Misch endured during his extraordinary survival of World War II in Berlin. Though he earned a doctorate in law, Misch went on to study music at the Stern Conservatory and dedicated the rest of his professional life to music. As a leading authority on Beethoven, Misch wrote the program notes for dozens of concerts directed by Bruno Walter and Wilhelm Furtwängler, some of which are preserved in Leo Baeck Archives. 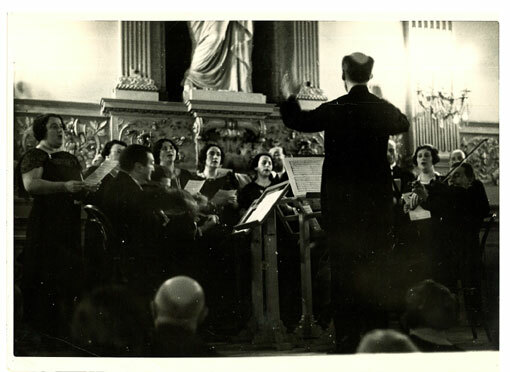 After the imposition of restrictions on the public activities of Jews in 1933, Misch became active in the Jüdischer Kulturbund Berlin as the director of the Jüdischer Madrigalvereinigung (Jewish Madrigals Association). An ad from ca. 1935 for Lukraphon records, a Berlin imprint that focused on musicians associated with the Kulturbund, demonstrates how Nazi policy increasingly circumscribed the activities of Jewish artists. 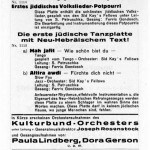 In 1933, Jewish artists were prohibited from performing for “mixed” crowds, and beginning in 1935, they were risked censure or worse for performing works by especially “German” composers. 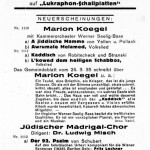 The records advertised here pair pieces with obvious Jewish connections – Mendelssohn songs based on a text by Heine, Psalm 92, composed by Schubert for a prominent Viennese cantor, and Jewish Folk songs arranged by Misch, with Die Ehre Gottes aus der Natur by Beethoven. Though Misch worked with Germany’s finest musicians before and after the Nazis seized power, he faced increasingly limited professional prospects. 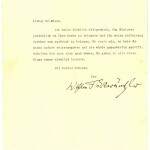 Married to a Christian woman, he avoided deportation, but his difficulty in earning a living is evidenced by, among other things, several letters from the conductor Wilhelm Furtwängler, who apparently intervened with a government minister on his behalf and wrote a general letter of recommendation for Misch, both of which are in the LBI archives. Archival evidence like this has played a significant role in the debates over Furtwängler’s decision to remain in Germany under Nazi rule. Misch’s papers also testify to the hardship of daily life in Berlin for Jews under Nazi rule. Among the many artifacts preserved here are a letter from a Nazi party member ordering Misch to remove his deck chairs to the Jewish part of the cellar in his apartment building, food stamps that were nearly worthless at the time they were issued, and a denied petition to purchase an alarm clock through a Jewish aid organization. After surviving forced labor, the war, and a Russian POW camp, Misch came to the United States in 1947, where he published several notable books about Beethoven and eventually donated his papers to Leo Baeck Institut. Advertisement for Lukraphon Records from ca. 1935. Founded by the Berlin businessman Moritz Lewin, Lukraphon issued recordings by Kulturbund Artists until increasing restrictions forced him to close the label in 1937.